Madras Market - a dream food court! So you like many food outlets in Chennai! There are food courts all over the place - but I know of no food court that serves food from some of the best in Chennai and certainly no food court that has Sandy's or Nigar Sultana's Daawat Biriyani under one roof or even under many roofs! So if you think you would like to take some of Nigar's biriyani, wash it down with fruit yogurt from Spoonbill or maybe have some Bradwurst from Spoonbill and wash it down with some of the best dessert in town from Sandy's Chocolate Laboratory, then Madras Market is the place! My good friend, Sarah Natasha started a humble community on Facebook called Chennai Shopping - it is not humble anymore! It rapidly grew to over 25000 members before a blink, but it did something more than having just a few thousand members - it gave almost everyone with something to show the world - a platform to do that! Suddenly we had talented people displaying their stuff and selling them. There were home bakers, home artists and 'little known but talented' people from all over showcasing their stuff and buyers from all over reaping the benefits. AGAM is playing and there is no separate entry fee for the music concert et all, so for Rs 75, this is a double deal!!!! And yeah, I think there is more than one band playing music too! By the time I finish writing this, I won't be surprised if they sign up another band to play - phew!!! 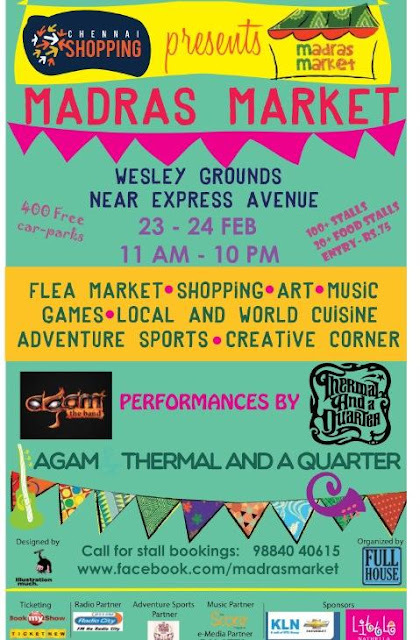 So this weekend, 23rd and 24th Feb, it might pay to leave all else and head to Madras Market. It is happening at the Wesley School Grounds (Opp Woodlands Theatre, close to Express Ave mall). Hoping to see you there! Chennai Foody: Madras Market - a dream food court!